Pamper your loved ones by sending them this Fancy Kids Delight Avenger Designed Tiffin Set exclusively meant to convey your wishes in the best manner. 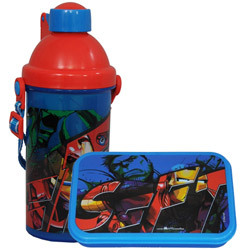 This Tiffin Set consists of One Lunch Box and a Water Bottle in Avenger Design. Specifications of this Set includes made of Food Grade Plastic Material, Leakage Proof, Air Tight, Microwave Proof, BPA Free, Easy to Carry while Traveling and Not Intended for use with Hot Beverages.